How do you define success? It is a crucial component to the challenges that face you when you are starting or growing a business. I cannot stress enough how important your definition of success is in this process. Be careful not to follow the formulas for success put forth by others. It is your business, and as such it needs to deliver what you’re after. Following the definitions that others put forth creates their ideal business, not yours. What are your priorities, and what weight do you give them? They all cannot be #1, and it is up to you to be clear about what you consider to be most important. Then you set your goals accordingly. I don’t mean to suggest that this is a simple task: It is daunting with good reason! The steps that follow will help you organize your approach. 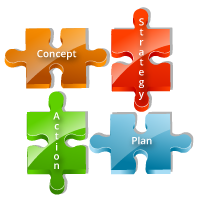 They “feed” the business planning process so that elements are addressed in a logical manner. Each piece has to fit together to move from one stage to the next.